When Collingwood needed a spark, Jordan De Goey provided it, kicking three goals in the Semi-Final win over Greater Western Sydney. Three of Collingwood’s rising young stars have been recognised for their superb seasons with selection in the AFL Players’ Association’s 22Under22 Team of 2018. Three Magpies have been recognised for their fine 2018 seasons with nomination in the AFL Players’ Association’s 22under22 squad. 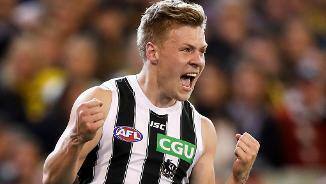 How good was De Goey! A competitive and versatile midfielder who has a knack of sparking his team when it needs it. The Magpies believe he can play as a forward in his own right and – like teammate Steele Sidebottom – rate his big-game potential. He is level-headed with ball in hand and has a real crack. After a delayed start to 2017, he finished the season strongly, and is poised to take his game to the next level in his fourth season. De Goey was unsighted until round seven, owing to a six-week penance for an off-field indiscretion on the eve of the season. He set about making good in the VFL, averaging 25 disposals in his three games in the state league before earning a recall against Carlton in round seven. He gradually grew in stature as the year wore on, marked by his breakout game against Hawthorn in round 15, when he collected 32 disposals, six tackles, eight inside 50s and seven clearances. 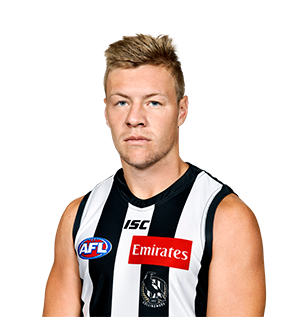 Three weeks later, De Goey was again at the forefront, kicking four goals from 20 disposals to almost singlehandedly drag Collingwood over the line against West Coast. Hip surgery saw him sit out the final fortnight of the year, but if his second half of the season is anything to go by, expect big things from the man in the No. 2 in season 2018. He may have been wearing a different number, but Jordan De Goey produced more of the same as what the Magpie Army saw in his debut season. The blonde-haired midfielder once again impressed with his grunt, and work-rate pushing towards goal as he extended his AFL games total to 36. A measure of De Goey’s success in 2016 was his ability to hit the scoreboard on multiple occasions. He kicked 16 majors in 20 games and ranked behind only Steele Sidebottom and Levi Greenwood as Collingwood’s leading goalkickers in the midfield. Official AFL statisticians Champion Data also noted that De Goey was the only mid/fwd in the league to rank above average for score assists and score involvements in 2016. It wasn’t all smooth sailing for the 20-year-old. A poor showing against Adelaide in round 17 led to De Goey being omitted for the Magpies’ following clash with North Melbourne. He also missed a round 20 clash with Richmond, when a return to the VFL appeared to light a fire under the former Oakleigh Charger. 27 disposals and two goals for the VFL Magpies was followed by three impressive performances back in the seniors before the conclusion of the season. With seven goals in his last three games, will De Goey pose a greater threat forward in 2017, or continue his rise into Collingwood’s midfield group? If Jordan De Goey thought that being drafted to the same club, on the same night as his good mate Darcy Moore was a dream come true, he had another thing coming. With just one pre-season and three NAB Challenge games under his belt, De Goey was thrown into the deep end as he was named to debut in Collingwood’s clash with Brisbane in round one. 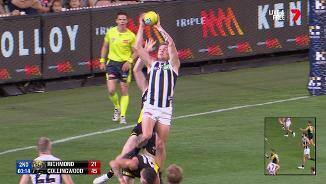 While pulling on the black and white stripes would have been a thrill, a green vest quickly covered the jumper De Goey was wearing for the first time. Playing as the substitute, he entered the game midway through the third quarter and collected five disposals as Collingwood claimed a 12-point victory. Perhaps hard done by, the 19-year-old was omitted from the AFL side after his debut and began to display a significant influence in the VFL Magpies’ midfield. He was named among the best players in all four of his VFL games, including back-to-back best on ground performances against North Ballarat and Essendon. De Goey returned to the AFL side for Collingwood’s round seven clash with Richmond and this is where he stayed. He played 11 straight games, was rested in round 19, and returned with a career-best performance in Sydney the following week. The individual success wouldn’t end here. With Scott Pendlebury playing off half-back in the Magpies’ Friday night game against Geelong, De Goey was given his first real opportunity to play as a permanent midfielder. The former Oakleigh Charger responded in the best way possible. His 25-disposal, seven-tackle and seven-clearance game was worthy of round 22’s National Rising Star nomination. 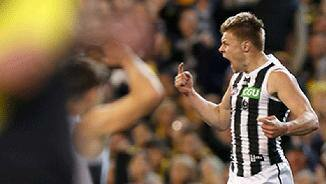 The accolades didn’t stop there for De Goey. At Collingwood’s annual Copeland Trophy event he was awarded the Harry Collier Trophy for the club’s best first year player. A competitive and versatile medium defender/midfielder, De Goey is strong overhead and in one-on-one contests. A good decision-maker by hand and foot, he impressed for Victoria Metro in the National Under-18 Championships, averaging 15 possessions and three marks at 74 per cent efficiency. He provided a spark up forward by booting three goals in the Oakleigh Chargers' Grand Final win, playing mainly forward, and generally makes the most of his opportunities.